Add some versatility to your barbell workouts with this hybrid Titan Multigrip Bar. 3 different grips set at different widths allow you to work muscle groups from different angles while reducing stress on your shoulders and wrist at the same time! 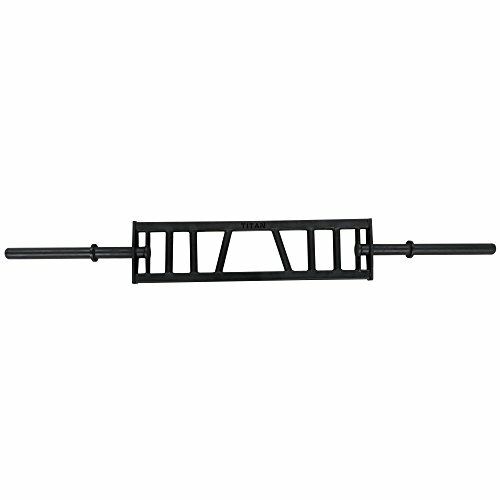 - Great hybrid bar to target specific muscle groups. - 1 set of angles grips (30 degrees) spaced at 10". - 2 sets of neutral grips spaced at 20" and 28.5". - Closed grip to target triceps or open grip to target chest. - 2" Olympic plate compatible. - Rackable on standard Power Racks. - 14" of loadable sleeve length. - Distance between sleeves: 53.25"
- Loadable sleeve length: 14"
1 set of angles grips (30 degrees) spaced at 10". 2 sets of neutral grips spaced at 20" and 28.5". Rackable on standard Power Racks.